Fat Quarter Shop's Jolly Jabber: Happy Quilting Day + Giveaway! Happy Quilting Day + Giveaway! Happy Quilting Day to all of our quilt-loving friends! How are you celebrating? Spending some quality time with your sewing machine? Putting the finishing stitches on a project? Or maybe starting something new? This year we want to celebrate with you! 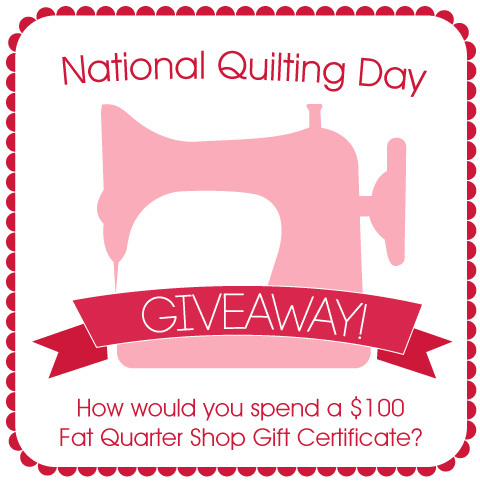 We want to know how YOU would spend a $100 Fat Quarter Shop gift certificate for a chance to WIN one! Comment on this blog post, letting us know what you would buy with big, fat FQS gift certificate. Maybe some notions, or a couple Jelly Rolls? Pick up some patterns or stock up on Mini Charm Packs? Your options are endless! We will choose THREE lucky winners, so tell all of your quilty friends to enter! All three winners will be chosen Monday 3/17/14 and announced here on this blog post. This giveaway is open to ANYONE in the world, and be sure to include your email address in the comment to win! UPDATE!!! Our three lucky winners have been chosen! I would love the opportunity to drool and decide between jelly rolls and layer cakes - so many choices. I think I may need a little "modern or bright" fabrics. Wow! It would be great to win $100for fabric! I have been eyeing Moda's Low Volume fat quarter bundles for one of the quilts in the book "Sunday Morning Quilts". I've always made brighter colored quilts before. I've never made a low volume quilt and would love very much to try one. Thanks so much for the opportunity to win! HI!!!! One hundred dollars in fabric fabric fabric!!!! I would love to have some April Showers!!!! I am getting ready to do a triangle quilt along and need some blues!!! So more fabric!!!! It would be so fun to pick out $100 in fabric!!! Thanks for the fun!!! Thank you all for playing. We hope you had a lovely Quilting Day! Be sure to check back to the Jolly Jabber for more giveaways!